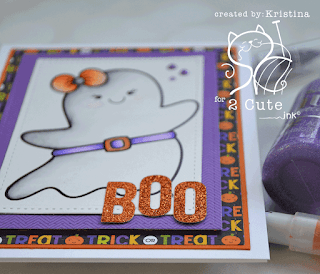 K's Kraftology: Boo to you! Howdy and hello to you all! 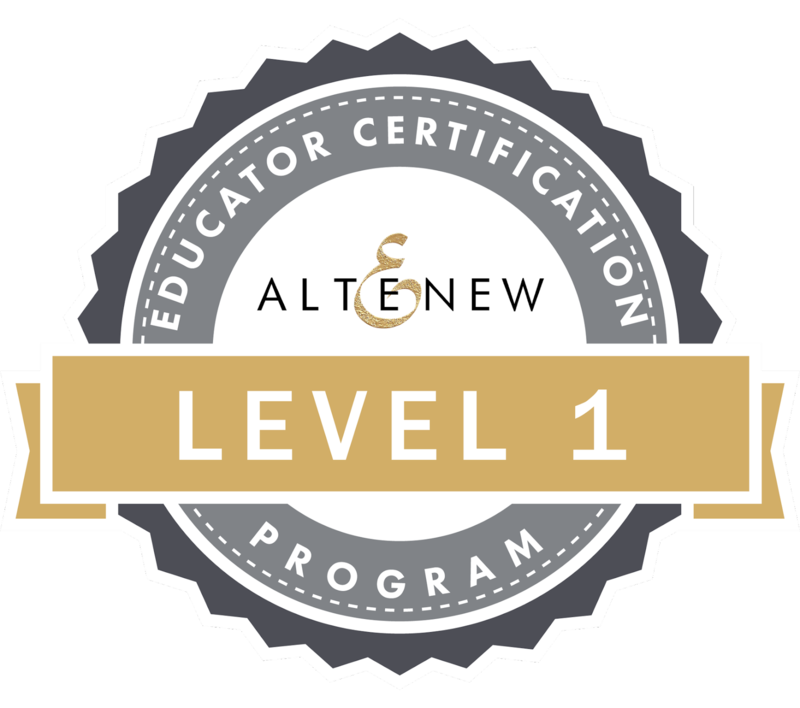 I'm back today with some more good news to share. After being a long time fan (and collector) of 2 Cute Ink digital stamps, I'm now a design team member! That means there will be lots of cuteness headed your way! 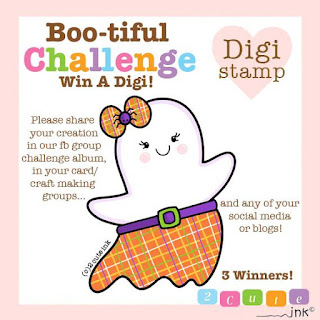 Right now she has a Boo-tiful Challenge going on over on her Facebook group and social media. You can join the Facebook group right HERE. 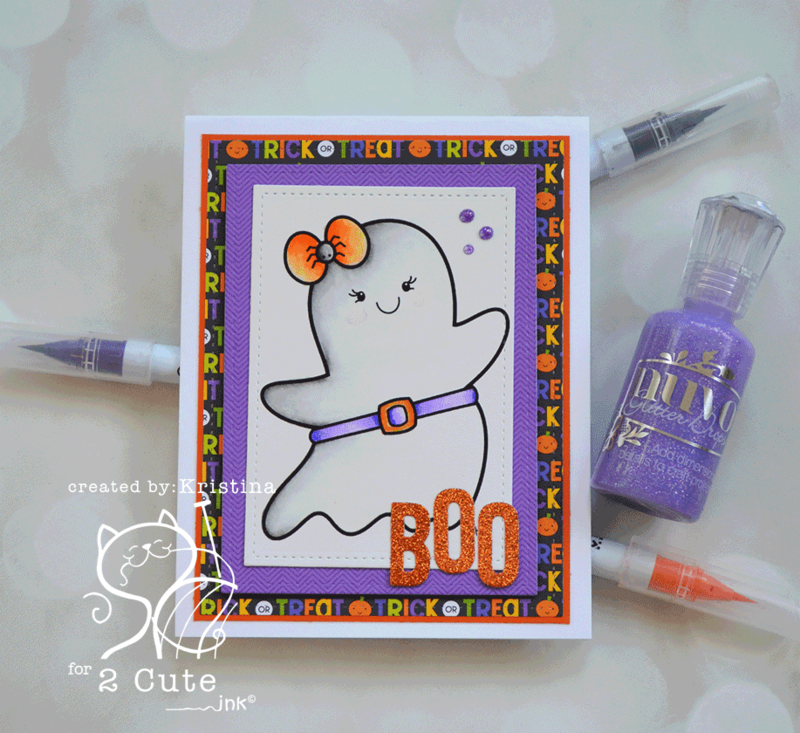 The super cute, Boo-tiful ghost to use in the challenge is available HERE in Heidi's 2 Cute Ink Etsy store! Now, on to my very first project to share with you! 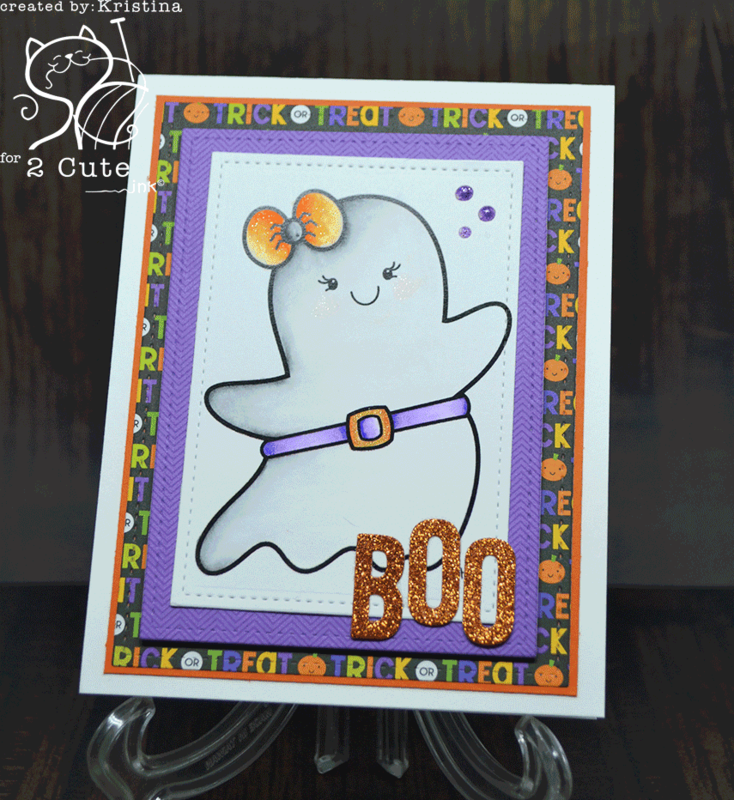 This ghost is oh so adorable! I went for a fairly simple card. I printed out the ghost on Bristol Smooth cardstock because I knew I wanted to use Zig Clean Color real brush markers to color the image. I printed it fairly large so the image could be the showcase of my card. I added Dark Gray along the far left side of the ghost. I used Pale Gray to blend it out a bit and finished blending with a waterbrush. For the belt I used Deep Violet. I added just a touch of color at the edges of the belt and blended with the waterbrush. For the buckle I used Orange and went over it with a gold wink of stella brush to give it some shimmer. For the cheeks I added the slightest bit of Carmine Red. I blended and blotted at the color with a paper towel until it was very pale. Then I painted the spider with the dark gray and the bow with the same orange. After everything was dry, I added clear wink of stella to the cheeks and the bow. 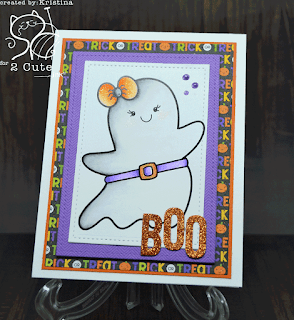 I then used a stitched rectangle die from Lawn Fawn to cut the ghost panel. The purple paper is from one of my (hoarded) Doodlebug paper pads. This one is from Ghouls & Goodies. 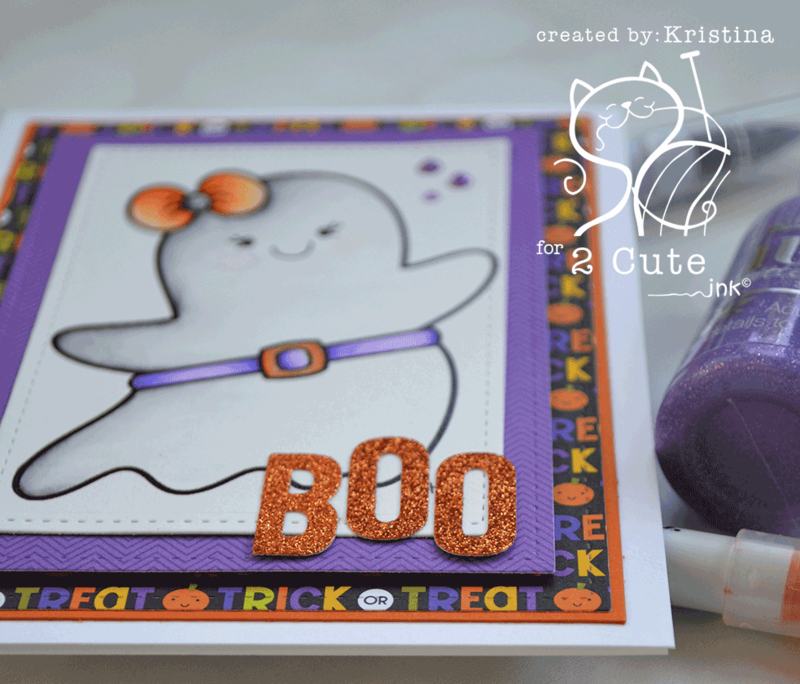 I used the next larger stitched rectangle die from the same set to cut out the purple paper. I went ahead and adhered the purple and ghost layer together. I went back yet again for the NEXT largest stitched rectangle die. This black layer is from the same Doodlebug paper pad. Did I mention I'm addicted to Doodlebug paper and sprinkles?? The orange layer I cut with my paper trimmer because I wanted it to be such a tiny border. This layer I adhered to a white, top fold card base. I put a generous amount of foam tape on the back of the purple layer and adhered it in place on top of the black layer. I still wanted to add more shimmer to the card so I dug around through my stash until I found some lovely orange glitter paper from Lawn Fawn. I used the Coles ABCs (also Lawn Fawn) to cut out the word "boo". I glued these down with liquid glue to the ghost layer. Since you can never have too much sparkle, I added a few drops of Lilac Whisper glitter Nuvo drops. All done! Here's a few more pictures just because! I think she turned out super adorable but I might be biased. Like this cutie? There are lots more to be found in the 2 Cute Ink Etsy store -----> 2 Cute Ink. 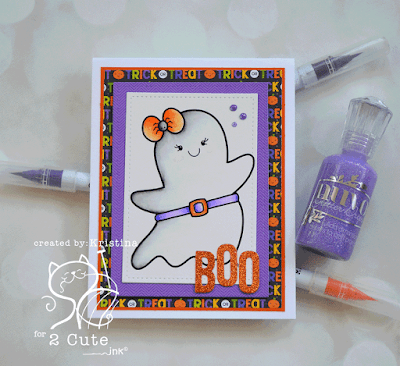 Stay tuned for more 2 Cute Ink cuteness heading your way soon!